Art Imitating Life…Or Is It Vice Versa? Fuming Guerilla Productions Is The Answer to Gallery Quality, Street Art & Graffiti Inspired Mural Designs For Interior & Exterior Spaces. We have all approaches covered for your aesthetic. We're more concerned about creativity and a story than just color on a surface. If you want to enhance or transform an environment, then let us design something specifically suited for you. Being able to convey the importance of community and unity through art is one of the most powerful ways to connect with people. Jetty Extracts is a company that understands this and sponsored the Ghost Ship Memorial mural featuring the talent of the Oakland artist, Vogue. We have experience designing interiors for businesses and offices that become an essential part of the environment. Not only does this make an earned media opportunity, it makes a nicer work environment for the employees or volunteers. If you need your patrons to have a strong impression from the outside to the interior, we have the ability to make that happen with custom lettering. From graffiti styles to traditional typography to mimicking your brand's type, we can ensure the letters are equally as powerful as images. Showcasing One Type Of Art, Using Another Type. Glow Glass Studio is located in North Oakland amongst residential and commercial buildings. 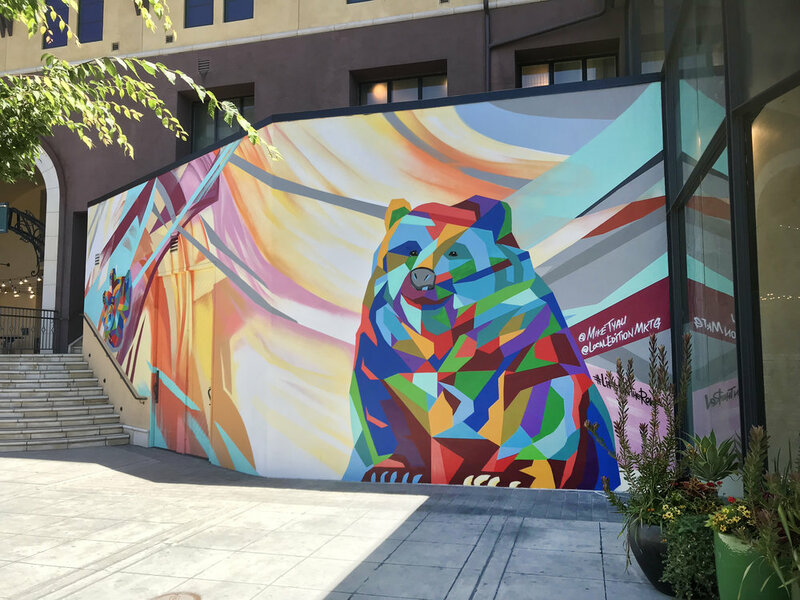 Golden Gate is a vibrant neighborhood right next to Berkeley and has an active community group working to make things interesting and fun for the residents of this neighborhood. When they were considering funding a cornerstone mural that would be the beginning of many more to come, they trusted FGP to know what to do in terms of creative process and theme. Glow Glass Studio was the building chosen. 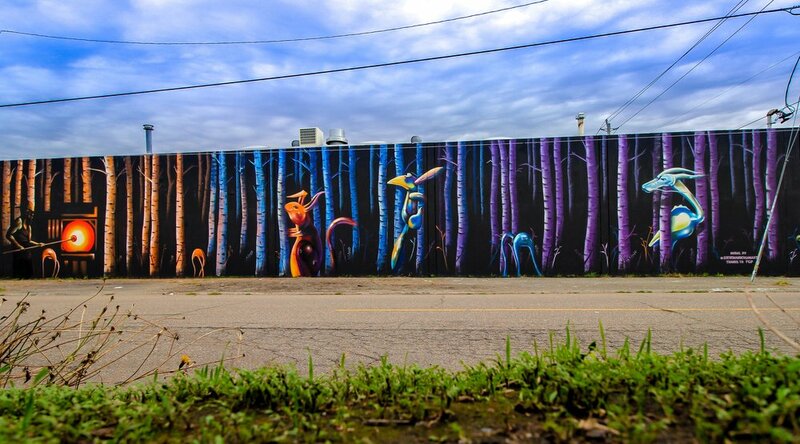 We wanted to hint as to what goes on inside this building by creating a mural that depicts the glass blowing shenanigans creating weird and wonderful creatures come to life and set free in a fantasy forest filled with birch trees. Green Living With An Artful Outlook. City Ventures' new project located in West Oakland is a good one for commuters. Located as close as you can get to the bridge taking you to San Francisco and a few minutes from the 880 freeway as well as West Oakland Bart, it's easy to get around. There is solar power included in this community...oh yeah, and art! FGP finished our 1st of 2 murals that serve as the frontage road wall. Rather than leave it uninspired, we took you through a contemporary and abstract time-line of West Oakland history. An Abysmal Office In West Oakland Gets A New Look. The building owner and employee of Wrist Ship Supply (the largest shipping company in the world headquartered in Denmark) wanted to turn his building into an inspiration. They called upon FGP to do something that would fit the neighborhood and honor both the history of West Oakland but also be contemporary. 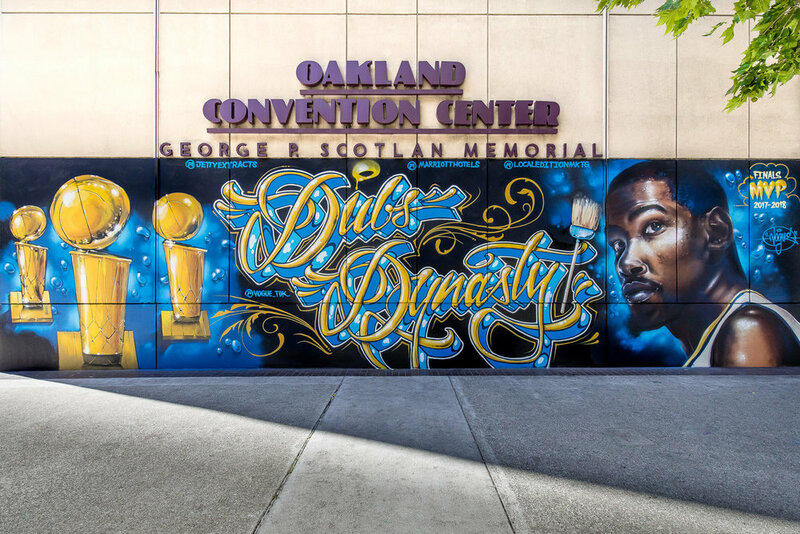 This mural led by master artist Vogue and a host of skilled guest artists and a few interns has become an iconic Oakland must see spot for public art. 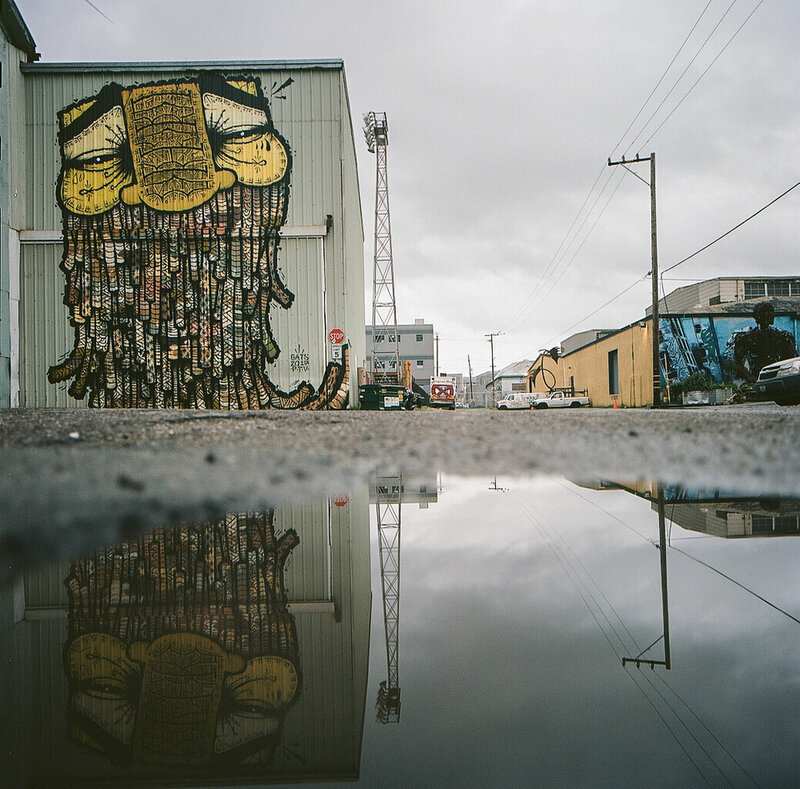 When you have two Oakland Artists that originally came from Albuquerque New Mexico, painting in Anchorage Alaska, what is the result? A North By South West original. The design aesthetic of David Polka and the wildlife lover Ernest Doty bring this mural to life that honors the Bartlett High Golden Bears and makes for a beautiful mural at home in rugged Alaska. Mr. Langhammer called on Fuming Guerilla Productions to do something outrageously fun for his glass studio in Oakland, CA. The results were so spectacular and gained such notoriety that he wanted to do something equally as interesting for a large cement wall in his backyard. The artist for the job was Ryan Montoya, with his vintage 60's illustrative comic book style he made a foundation of art as the centerpiece for this private backyard. A unique non-profit rescue helping find homes for Oakland's most vulnerable shelter cats since 2011 and operating the Cat Town Cafe since 2014. A project close to our hearts, because... cats! NEED MORE THAN MURALS? CLICK HERE.